When it comes to damaged water lines, pipe connections and sewer lines on your property, finding the best possible solution can be a little tricky… especially when today’s most advanced solutions come in various specialized forms, each ideal for certain types of pipeline damage. Such is the case for trenchless technologies, which use cured-in-place epoxy Perma-liners to coat and seal cracking, fissures and corrosion to home water systems. How can you determine what solution (directional boring, pipe bursting, sectional point repair…) is right for your exact needs? To find this information, you can do one of two things: either contact your local Toronto trenchless technology expert and have them inspect your home pipe line damage, or continue reading this article. For general pipe damage, such as those caused by soil shifting, cracking, penetration or other environmental causes, cured-in-place pipe (CIPP) lining is quickly becoming the go-to solution for Toronto homeowner nationwide. By using epoxy resins and plastic Perma-liners, trenchless specialists can fully repair your damaged pipe lines in a mere matter of hours with these techniques. 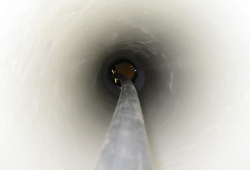 In pipe lining applications, a small entry hole is drilled to the existing pipe, through which the epoxy resin and a compression air bladder are fed. This resin is coated along the pipe in question, and cured-in-place as the air bladder expands. After a short hours’ time, the damaged pipe is completely repaired, without excessive digging or excavation to your lawn. This has huge savings implications on corrective landscaping and property renovation. Pipe relining is the ideal solution for situations where corrosion, cracking or damages affect a moderate to large portion of pipe, but not severely enough to require full pipe replacement. For pipe damages localized around a smaller area of pipe, such as a joint or isolated crack, trenchless sectional point repair can almost always fully restore that pipe section with the same epoxy solutions as full relining. In these applications, trenchless experts will use two small, controlled entry points to insert lining resin and the curing air bladder. Once in place, specialists will cure the resin to the localized pipe damage section, completely resolving minor damages without having to reline your entire pipe. Trenchless technology is all about efficiency; sectional point repair takes an already efficient process and improves upon it, granting the same benefits as standard pipe lining in circumstances where full lining would be impractical. No matter the extent of your home’s pipe damage, there are innovative trenchless repair solutions that can return your pipes to peak performance in minimal time, and with minimal effects to your property; best of all, these solutions are affordable under any budget. However, sometimes a pipe will be damaged so thoroughly, or situations so dire, that pipe lining solutions will be ineffective in repairs. In these circumstances, homeowners are forced with fully replacing their existing pipe. Traditionally, this would require costly, property-damaged excavations, and long hours of manual digging and labor; pipe replacement under conventional means is an absolute nightmare for homeowners in almost all cases. Fortunately, these replacement methods aren’t necessary for salvaging your plumbing, as today’s advanced trenchless repair technologies can fully replace your pipe without ever having to actually dig the damaged line out. By using a sturdy, conical bursting head, specialists completing pipe bursting in your home will literally burst through your old, damaged pipe, and seamlessly install a replacement line at minimal risk to your lawn. The replacement pipes, in these cases, are physically attached to the burst head, and slides into place as the bursting head cracks, fragments and pushes away the damaged pipe. Pipe bursting delivers all the performance benefits of digging replacements, and avoids the costly lawn damage, labor hours and risks associated with it. Don’t worry if your home’s pipes are too far damaged for relining to be effective; there are trenchless solutions available in Toronto area that can fully replace your pipe with the same speed and ease as lining. Today, the best way to handle home pipe damage is by contacting your local Toronto trenchless technology expert. The solutions they provide can perform effectively for decades to come, while costing your far less than any other pipe renovation method. With large-scale, digging pipe repairs, you’re only robbing yourself of the easy benefits that trenchless technologies bring.